As the delicate dance between Masaomi, Mikado and Anri continues, by the end of the previous episode Anri found herself in trouble once again (something which seems to have become a habit of late) as she attracts the attention of a group of Yellow Scarves members. As information about what is going on reaching the Dollars, so Mikado changes his tune from one of regretting that the Dollars had ever been formed into using the powers that this group brings to save Anri from danger (oblivious as he is to the fact that Anri is probably perfectly capable of saving herself) - Thus begins a fantastic madcap chase between Anri and said group of Yellow Scarves members that involves a number of people and a rabbit costume. This stop-start chase soon takes another turn, as Kida steps into the fray as mobiles are buzzing from all angles, confronting Anri in a rather accusatory manner about why she was spying on him, accusing her of being in cahoots with Mikado when of course this wasn't the case at all - Thus another piece in Izaya's plan falls into place as Anri gives Masaomi the slap he deserves, before finally being picked up by Selty and taken into the safety of her and Shinra's abode. Such safety is, of course, only temporary, with the tension between Yellow Scarves and Dollars accelerating rapidly, with both Masaomi and Mikado effectively abandoning their respective factions, but far, far too late to actually do anything about the escalating situation. Although time seems to be running out to resolve everything satisfactorily within this series, this was a simply wonderful episode - I think I could watch the antics of Dollars members as they respond to Mikado's requests all day long in their own right quite frankly, and the feeling of intensifying pressure on the three main characters is carried off almost perfectly with a subtle blend of characterisation and story-telling. Put simply, this was Durarara!! at its best and most enjoyable - A stark reminder of the fact that a big part of me really doesn't want this series to end. I completely agree, I'll miss the series when it ends. There was a bit of a dip in the middle of the run but I'm really enjoying it now. Easy to agree with wanting more DRRR!! Given the brilliant way this kind of action sequence was handled (and there was some similar action sequences on the Flying Pussyfoot, as I recall), it is a bit of a shame that more such sequences weren't worked into the series. Remember the first chase sequence with Dota-chin's gang (rescue of Koztano)? Of course you do, because it was really well done. 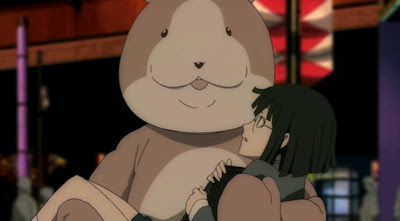 Just like Anri's escape in this episode, it included tension, surprise, and comedy. I'm sure, if they had managed to include another such sequence somewhere in the course of the last eight episodes, that would have gone a long way towards addressing people's disappointments with the middle of the series. Shizuo will be okay I hope. Without him, I'll have to give another :(. We haven't seen much gunfire at all in this series yet. It was certainly a very shocking and jarring way to end the episode. The preview for next episode made me fearful for Shizuo's fate. I'm crossing my fingers that someone got to him in time. Being the brother of one of the most famous actors around, his medical care would hopefully be top notch.